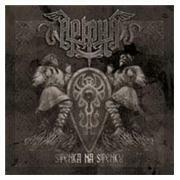 Russian Pagan Folk Metal act ARKONA has been around for some time now. I have reviewed them in the past, and always been rather favorable. A demo was released in 2002, five full-length albums, two DVDs and now this EP taster. Vocalist Masha “Cream” has been around since the days of pre-band HYPERBOREA, the others are now; Sergej “Lazar” on guitar, Ruslan “Kniaz” on bass, and drummer Vlad “Artist”. One new song and five exclusive non-album tracks coming up! The opener and title track is highly catchy and memorable. This feels “more” than I´ve heard from them in the past. Is it a bit of an adaptation to the alluring European market perhaps? There are smattering drums, Russian sing-along, fiery accordion, folk instruments, all in one brew. “Valenki” hammers on; very Russian, very keyboard-orientated, a tad “Kalinka” and a speedy solo, completes the picture. More folk than the acoustic “Goi, Rode, Goi” is not possible, or thereabouts. The letdown is personified by “Skål”. There are too much of choirs, catchiness and everything that is JULIO IGLESIAS to me. But that is almost totally forgotten with the closing track “Noviy Mir”. “A whoohooa hoa, heavy guitar, contagious keyboards, and a general feeling of a fine brew. This all makes for a strong competitor to the title track as to the best song on the album. As I said, I have reviewed this lot in the past, but not quite with such a smile on my face!